Camera naming conventions can be a confusing business - do higher numbers mean a better camera? Or lower numbers? Do more numbers mean it's entry level or pro? What do the letters mean? No conventions have been more confusing (initially) than those for Canon's mirrorless camera range, which began in 2012 with the Canon EOS M and has now reached the lofty heights of the M100. 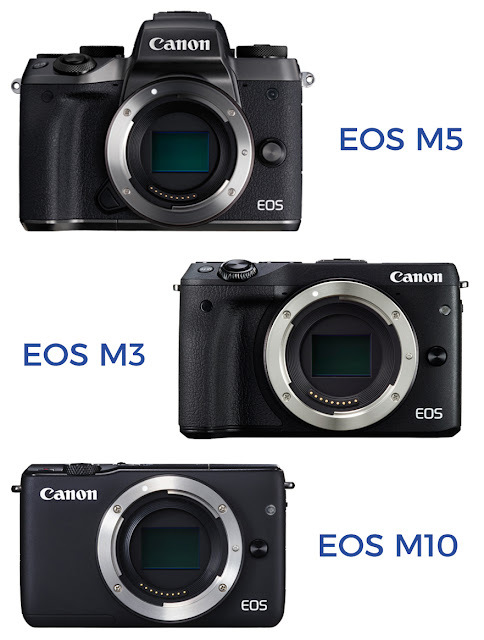 In the intervening time though, we've seen the M2 (which never made it to Europe), M3, M5, M6, and M10 - so the big question is - where to they all sit in the line-up, and which Canon mirrorless camera is for you? 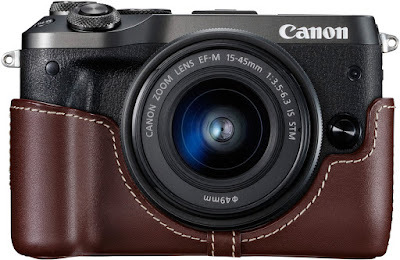 Back in 2012 when Canon released the original EOS M, the name made sense - M for Mirrorless. Then, they brought out a follow-up in 2013 which they logically called the M2, followed in 2015 by the M3. This naming convention was a bit confusing as it didn't follow a sequention (M, M2, M3) or the 'lower-the-number-the-better-the-cameras' convention that they've been running for decades with their digital SLR cameras. 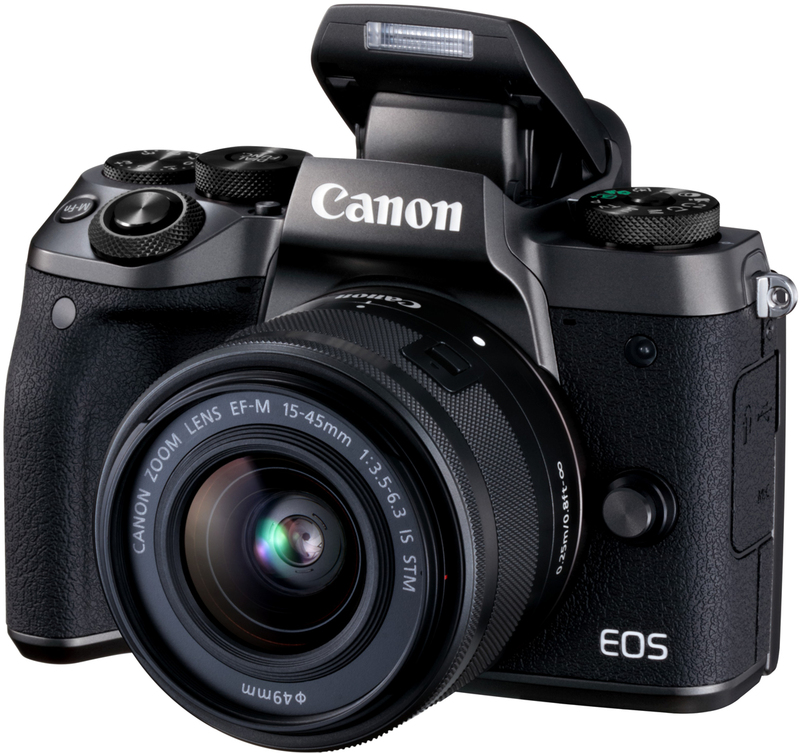 With that, in early 2017 Canon introduced the EOS M6 to break this stalemate and pave the way for a traditional naming convention that mimics that of their DSLRs. The EOS M6 sat above the M10 and alongside, but also above the M3 as a mid-range mirrorless camera below the EOS M5. 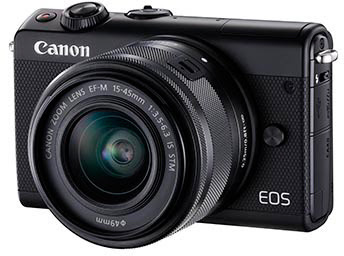 Now Canon have released their latest mirrorless interchangeable lens camera, the EOS M100 and discontinued the EOS M10. 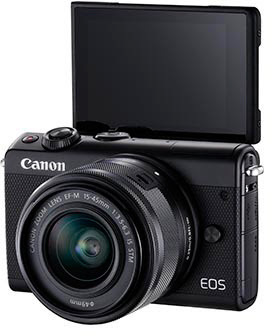 The M100 sits as an entry-level option into the Canon mirrorless camera range and supports the line-up with the EOS M3 and EOS M6 above it, with the EOS M5 at the top. So how do they all compare? 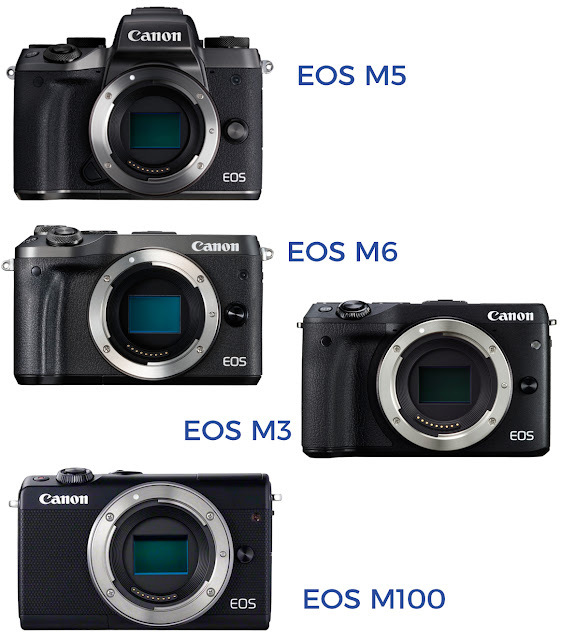 The EOS M100 has been introduced as an entry level mirrorless camera to replace the EOS M10 and establish a future naming convention similar to their DSLR range (i.e. 5D is better than 6D, which are both better than the 80D, and are all better than the 750D). The M100 is a compact, stylish entry-level mirrorless camera with a 24.2 megapixel CMOS sensor, Full 1080p HD movies at 60p, continuous shooting at 6.1fps, a 180-degree flip-up touchscreen with selfie-mode, and Wi-Fi, Bluetooth Low Energy, and NFC wireless connectivity. It's built as go-anywhere compact mirrorless camera for those who want the creative freedom to shoot with any Canon lens and the ability to share images to social media or friends back home from anywhere around the world. 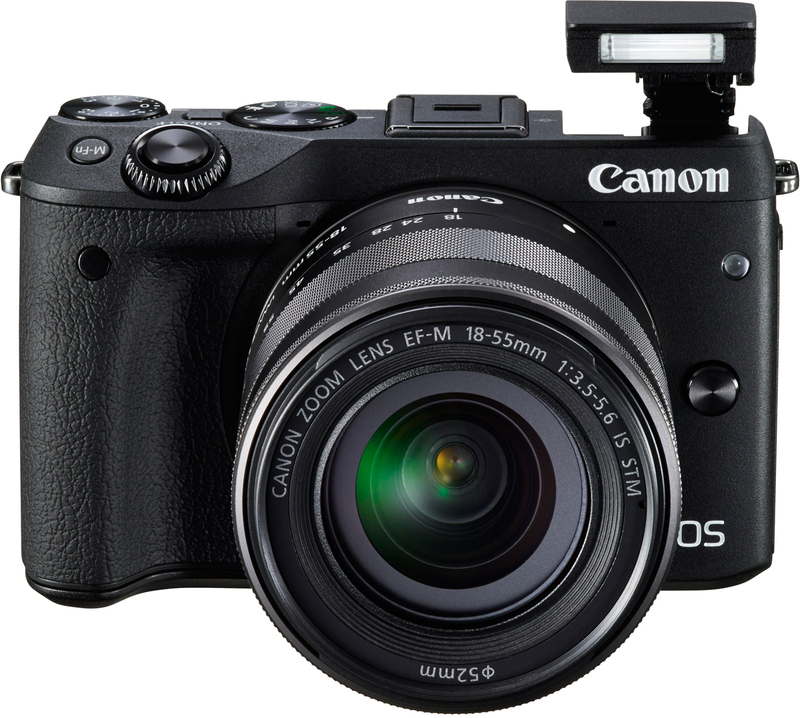 As a more advanced option, the Canon EOS M3 is broadly the same as the M100 on the inside, but it's the outside that makes the difference. The M3 has a chunkier hand grip for a more solid hold and a hotshoe on top for using external flashes. Moving up the range, the EOS M6 is a more DSLR-esque mirrorless camera, with a 24.2 megapixel CMOS sensor, Canon's fastest DIGIC 7 processor, Dual Pixel CMOS AF for pin sharp and fast autofocusing, and continuous shooting of up to 9fps. On the outside it's a slightly larger body with a firm, solid hand grip and hotshoe on top that accepts the dedicated EVF-DC2 electronic viewfinder for when you want to shoot like a pro. At the top of the Canon mirrorless camera range is the EOS M5 - essentially a baby DSLR with a bright and clear electronic viewfinder, hotshoe mount on top, DSLR-like control dials, 7fps continous shooting onto the 24.2 megapixel CMOS sensor. Full 1080p HD movies at up to 60fps that are processed by the DIGIC 7 processor. Dual Pixel CMOS AF handles the autofocus in the M5 and with a 3.2" touchscreen with Touch AF, it's easy and straightforward to use. For more information about the individual Canon EOS M mirrorless cameras, head over to our Canon Mirrorless Camera page or visit our website to see all the Canon EF-M mirrorless lenses that are available.